It’s like a fabric store confetti party going on in here! I am recovering the settees and have had my usual indecisive fuss over the past few weeks. What I want is creamy, soft, and plushy. What I have is a mechanic, black dog, and a dining table. I started with the usual outdoor brand fabrics but couldn’t find something I loved or that felt soft enough and regular upholstery material wasn’t going to hold up against the sun and stains well enough. 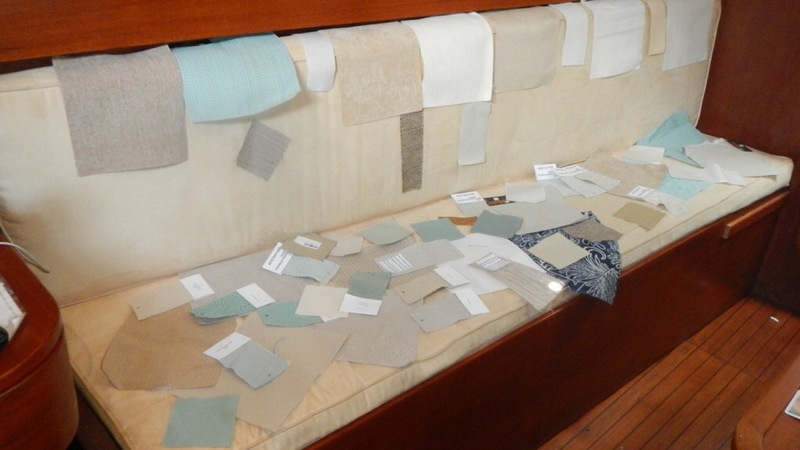 Then I found Crypton fabrics. 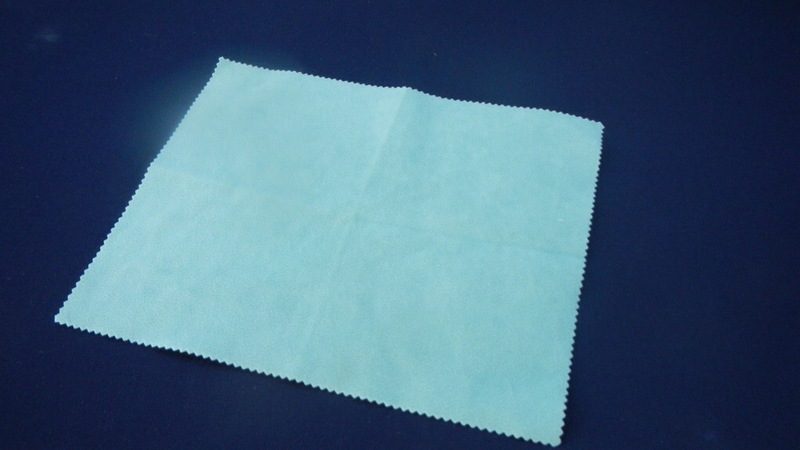 They are used in hospitals and restaurants yet feel super soft. 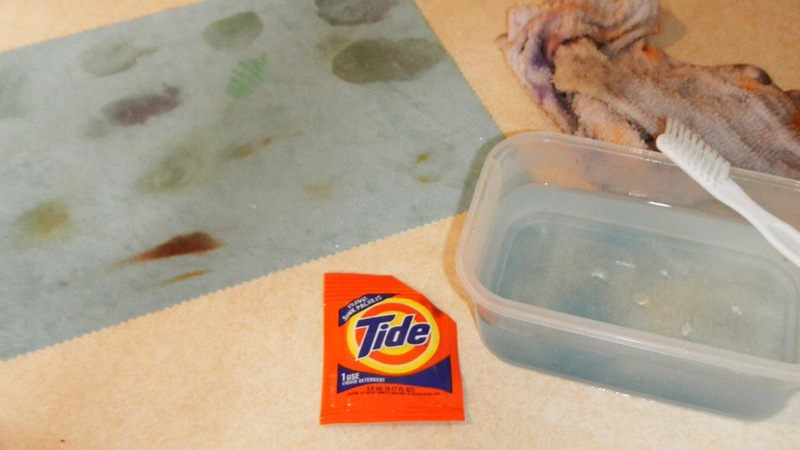 They are crazy stain resistant and clean with laundry soap or even bleach. I got a free sample from the website. 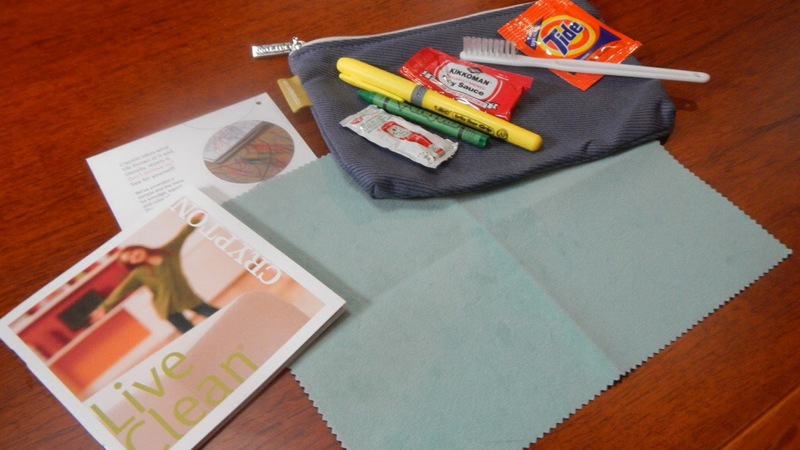 It came with a swatch of their fabric, ketchup, soy sauce, a crayon, a highlighter, and a packet of Tide all zipped up in a cute pouch. Ooh. I do love an experiment! 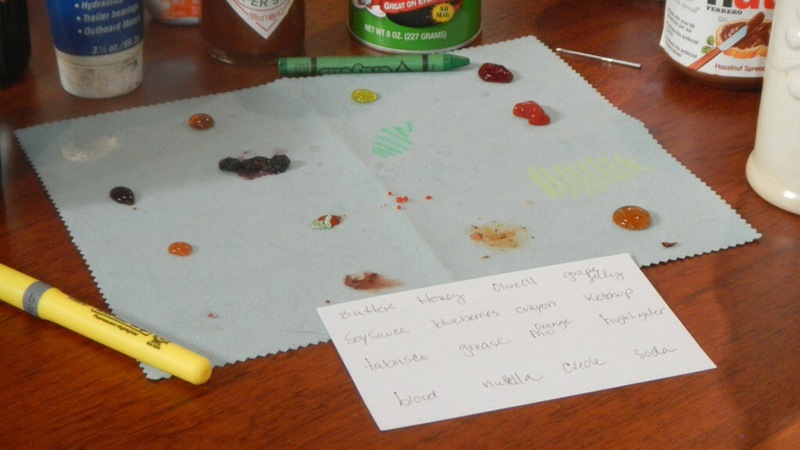 I thought I might add a few things to the stain test-like blueberries, chocolate, butter, olive oil, grape jelly, honey, soda, and Mio (AKA: safety-orange food coloring) because it is our dining room cushions and these things will spill on them eventually. Then I added winch grease and blood, because again, it’s a boat and we can be messy. 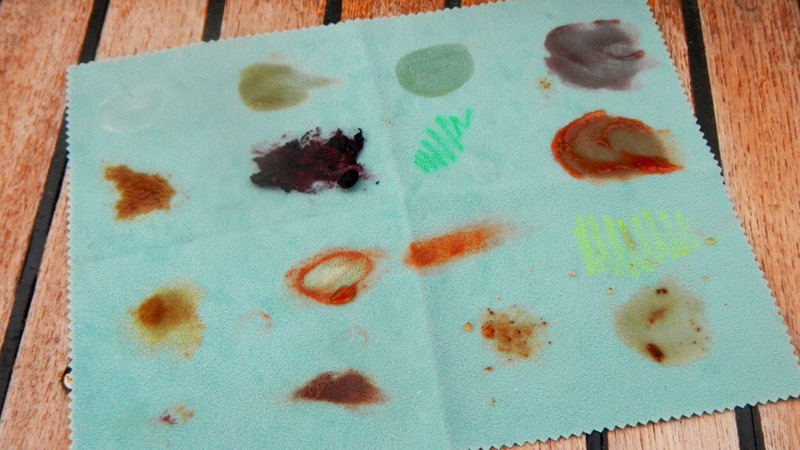 I documented my stains, to make it an official experiment, and smeared and rubbed away. It was kind of fun. Keith liked the blueberry part the best. I set it out in the Florida sun to cook. Then I wiped it off, mixed up my teaspoon of laundry soap and washed it up. 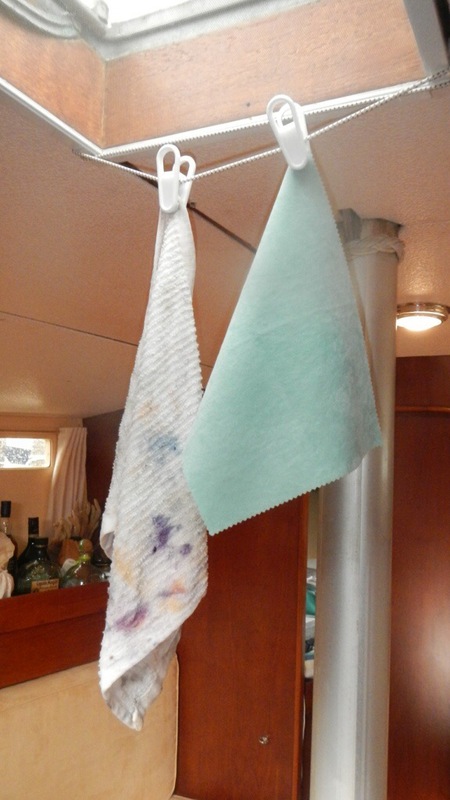 I hung my sample (and the towel I used to clean it with) up to dry. Perfectly clean!!! The Crypton, I can’t say the same for my dish towel. Well that just narrowed down my search. We want the blueberry proof fabric! Keith and I picked out our two favorite and and ordered a yard of each to decide. Anyone who knows me, can already tell you what colors I chose. I have an extremely small color palette comfort zone; I am a bit predictable. 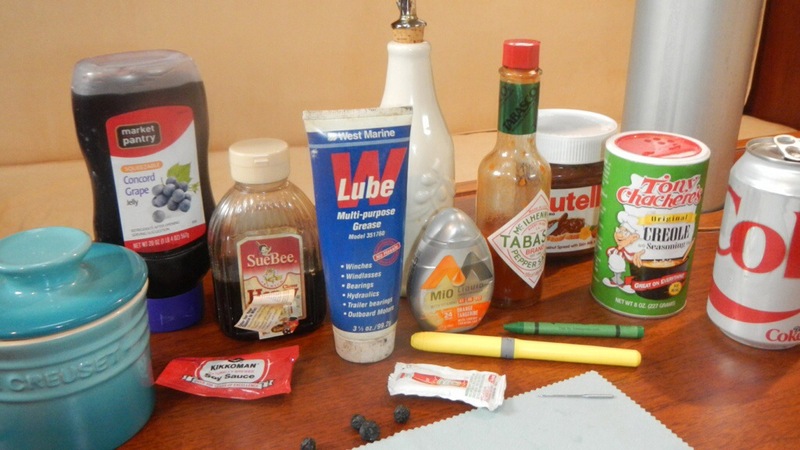 That is pretty cool that they gave a few samples of mess making items to prove their product works. Your additions were more realistic in the environment it’ll be used. I’d like to redo the cushions on my boat and thought of one of the indoor versions of Sunbrella but I think this Crypton might be worth looking into. I’ll see if I can find the sample myself and check it out. Look forward to seeing your finished cushion project. Thanks for the idea. If you are interested in the crypton, they sell it through Joann fabrics (online only) and it ships from Crypton. They have over 700 choices. The samples are $3.00 a piece. The joann website is really bad at depicting the color/print accurately so I would definitely suggest getting samples first. If you wait, it will frequently be on sale for 50% off and there are usually coupons for an additional 15%. It brings the price per yard to 20-25 dollars a yard. Comparable to sunbrella which is what I thought we were going to use when I started looking at fabrics. 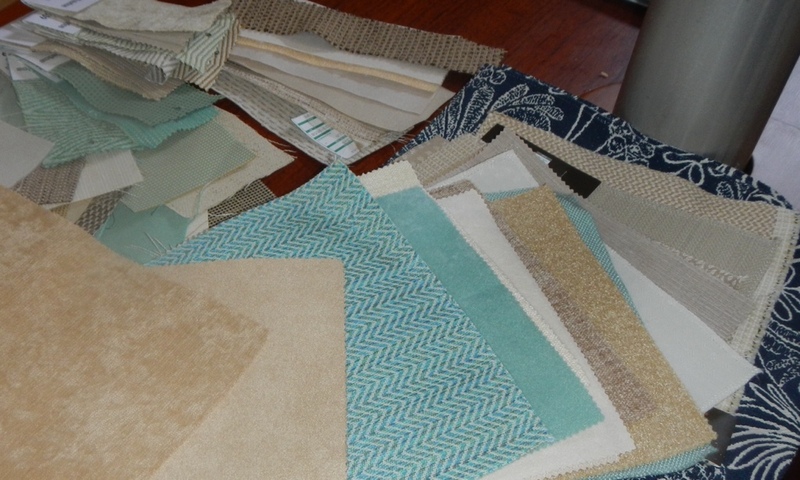 The sample from crypton website was free, but you don’t get to pick the fabric swatch. By the way your boat projects are coming along great-the new dark red boot stripe is going to look nice! Got some Crypon samples a month or two ago. Different types to get an idea of how they felt. I think I settled on one. Just went to JoAnn and found they’re doing a sale now for 50% off the store price, which is already less than direct from the company. Now, I just need to figure out how much I need to redo my boat. How have your cushions held up over the past year and a half? Daniel, we still LOVE the crypton material. The are showing no wear and no stains. Lots of dog hairs. Lol. Don’t sweat it too much if you miss the Joann sale, they pretty much run it every other month o you can et a 40% off coupon in the Sunday paper every week. Just don’t pay full price, no need to. I’d love to see pictures of your project when you get it done! Let me know if you have any more questions. You can take the woman out of the lab but you can’t take the lab out of the woman. Looks like fun.